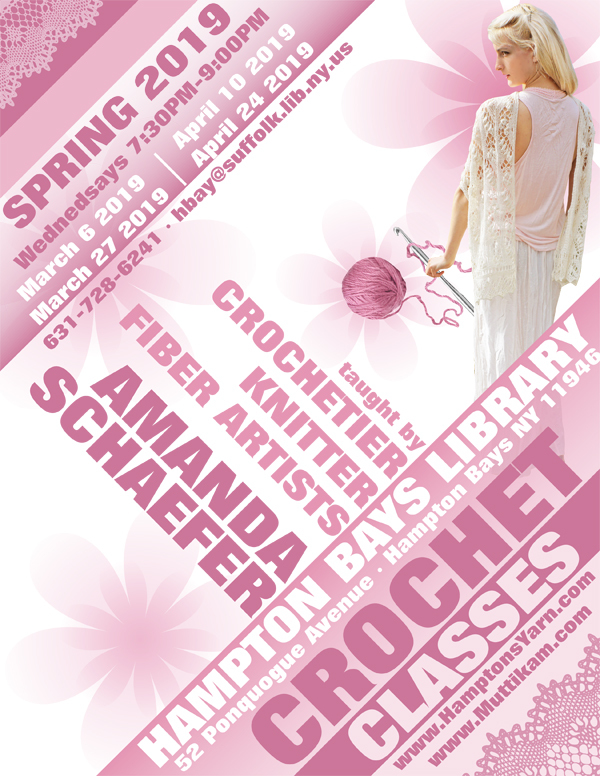 Crochet Classes with Amanda Schaefer crochetier / knitter / fiber artist at the Hampton Bays Library on Long Island, New York. 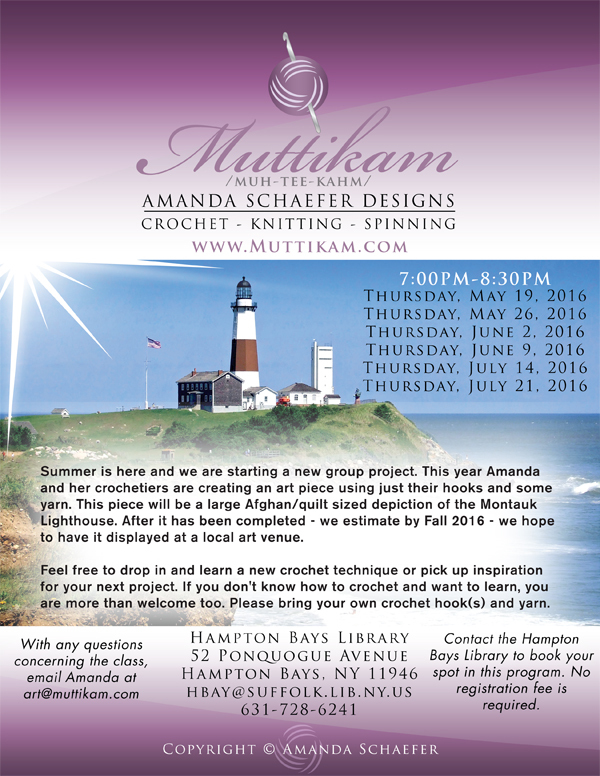 Amanda is available to teach crochet and knitting classes, seminars and/or workshops on Long Island, New York. 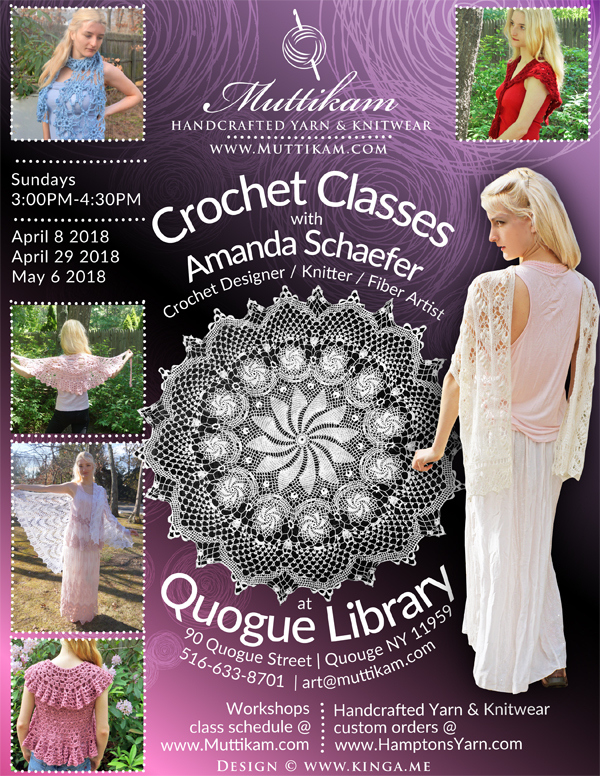 If you would like to start up crochet classes at your local library, community center, or yarn shop, please ask the director or management to email Amanda at art@muttikam.com. 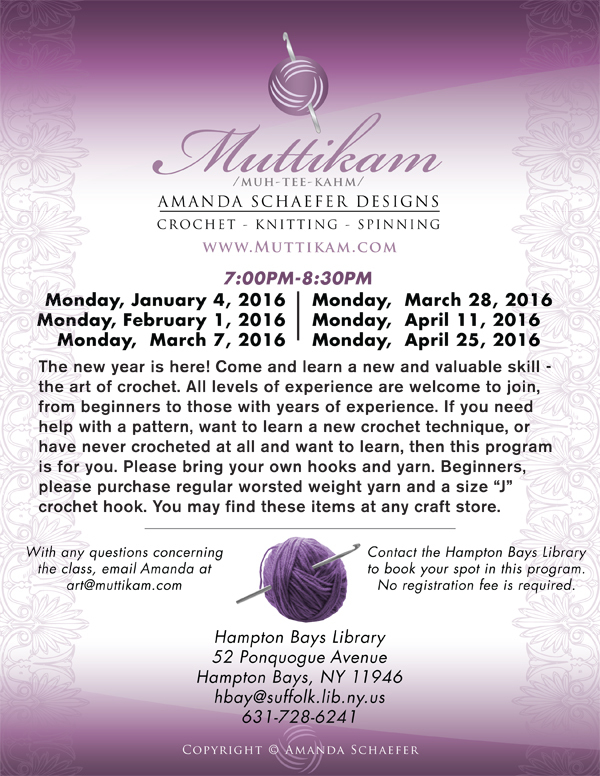 Amanda is able to teach to all age groups, from those who are beginners to crocheters with years of experience. Amanda has over two years experience teaching crochet, and has been crocheting for	over seven years. 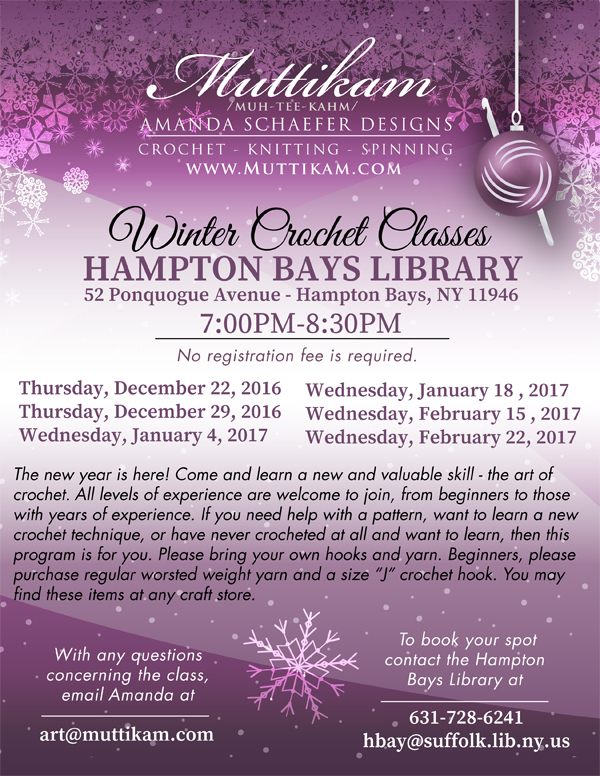 Come and learn a new and valuable skill - the art of crochet. All levels of experience are welcome to join, from beginners to those with years of experience. 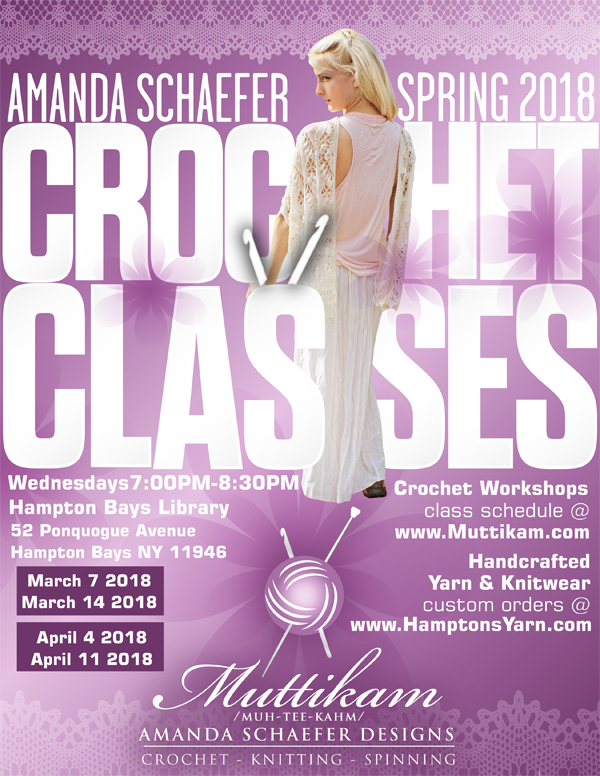 If you need help with a pattern, want to learn a new crochet technique, or have never crocheted at all and want to learn, then this program is for you. Please bring your own hooks and yarn. Beginners, please purchase regular worsted weight yarn and a size "J" crochet hook. You may find these items at any craft store. 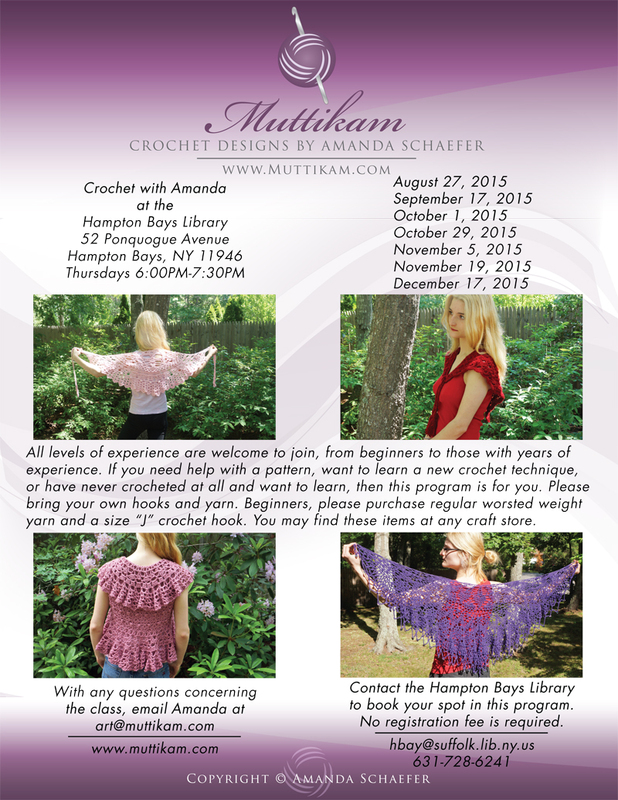 Come and learn a new and valuable skill - the art of crochet. All levels of experience are welcome to join, from beginners to those with years of experience. 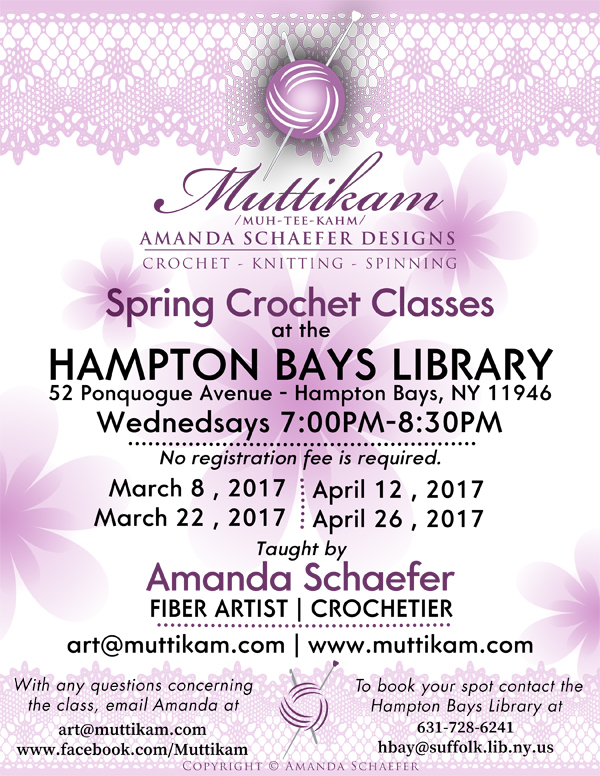 If you need help with a pattern, want to learn a new crochet technique, or have never crocheted at all and want to learn, then this program is for you. Please bring your own hooks and yarn. Beginners, please purchase regular worsted weight yarn and a size �J� crochet hook. You may find these items at any craft store. The new year is here! Come and learn a new and valuable skill - the art of crochet. All levels of experience are welcome to join, from beginners to those with years of experience. 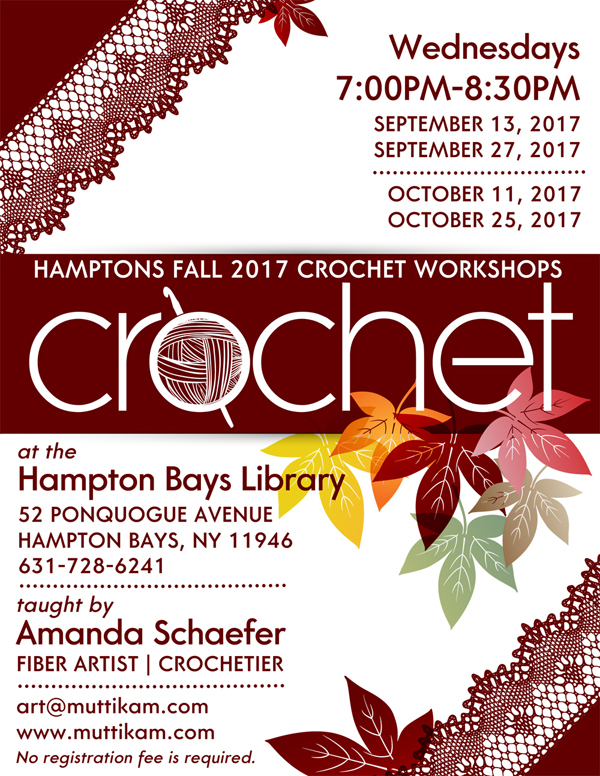 If you need help with a pattern, want to learn a new crochet technique, or have never crocheted at all and want to learn, then this program is for you. Please bring your own hooks and yarn. Beginners, please purchase regular worsted weight yarn and a size �J� crochet hook. You may find these items at any craft store. Summer is here and we are starting a new group project. This year Amanda and her crochetiers are creating an art piece using just their hooks and some yarn. This piece will be a large Afghan/quilt sized depiction of the Montauk Lighthouse. After it has been completed - we estimate by Fall 2016 - we hope to have it displayed at a local art venue. This summer and fall 2015 will be focusing on our group project, creating a crochet ensemble for a life-size artist doll. Amanda and her crochet students are putting their skills to work by creating an entirely crocheted ensemble for a life-sized artist doll. Each student participating has been assigned a piece of the outfit to crochet. 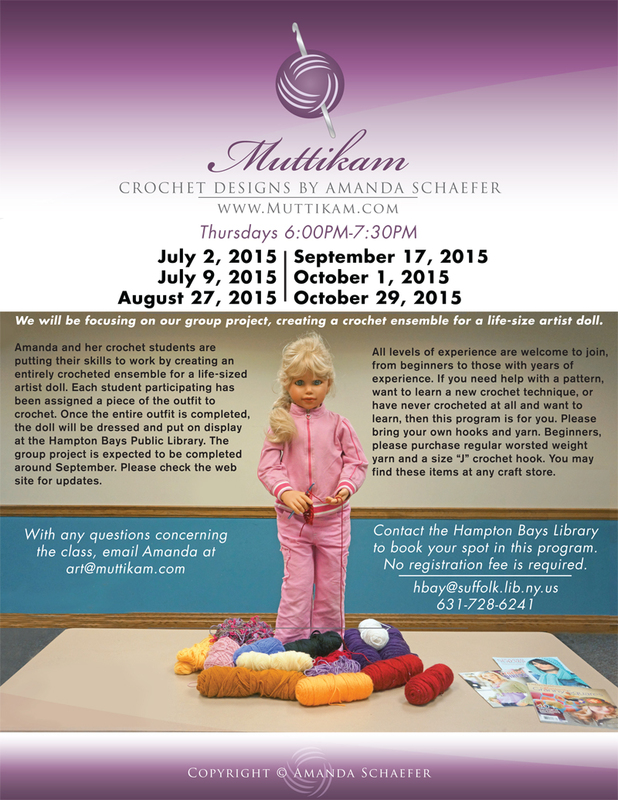 Once the entire outfit is completed, the doll will be dressed and put on display at the Hampton Bays Public Library. The group project is expected to be completed around September. Please check the web site for updates. All levels of experience are welcome to join, from beginners to those with years of experience. 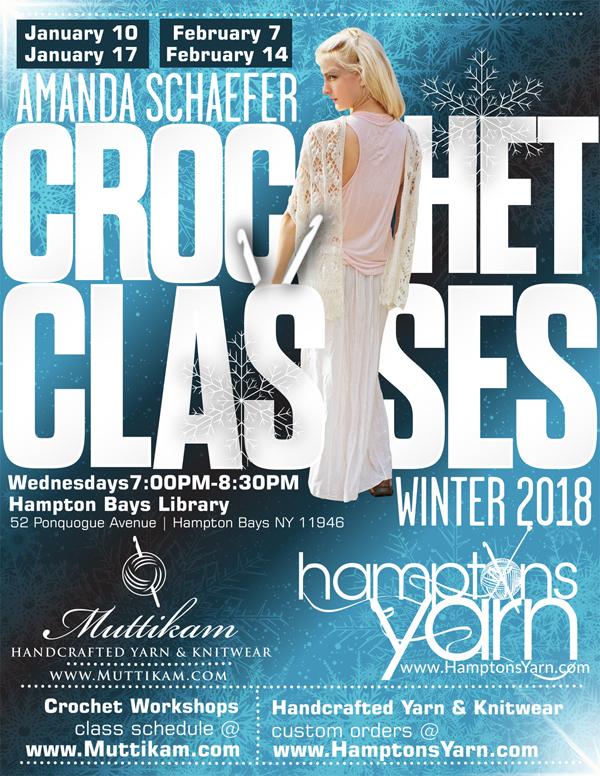 If you need help with a pattern, want to learn a new crochet technique, or have never crocheted at all and want to learn, then this program is for you. Please bring your own hooks and yarn. Beginners, please purchase regular worsted weight yarn and a size �J� crochet hook. You may find these items at any craft store.